The rich, fragrant tips of Balsam Fir Trees make this incense a north woods classic. The fragrant aroma creates a woodsy atmosphere for those longing for the natural scent of an evergreen forest or thinking of a quiet day by the lake or in the mountains. 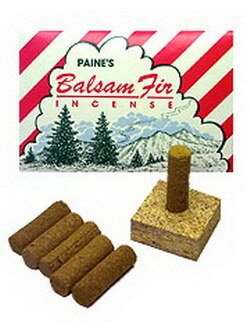 Paine's Balsam incense, made from the christmas tree trimmings, is a tradition at the holidays and throughout the year. Contains 54 - 1.25" incense logs and wooden burning base (fits in log cabin below). These are indeed the best. While I enjoy a variety of incenses, the simple joy of the aroma of wood burning is absolutely relaxing. Your home will be filled with the aroma of a smokey forest within seconds. I just wish they would last longer, they typically smolder for about 15-20 minutes. The aroma lingers though.